So, ReadyNutrition Readers, last week we covered the finer points of the “3-G’s” for herbs…garlic, ginger, and ginseng. I want to expound a moment on those benefits I covered on ginger. Hopefully you guys and gals like ginger ale. It is really good for aiding with the digestion after a large meal, and I have found it to be an excellent tonic for upset stomach. Besides all of that, it tastes really good, and I like the daylights out of ginger ale to begin with. In a nutshell, here are the ingredients and supplies you’ll need to make yourself a batch of delicious ginger ale. So, if you’re a ginger fanatic the way I am, you can add up to 2 tablespoons, but be advised: it will have quite a bite when you’re done! You can chop up the ginger fine, and peel it if you wish. I just rinse it off and use all of it. Also, I slice mine into really thin slices. When this is done, throw it in the sturdy plastic bottle. Next, add your ½ cup of sugar. Then squeeze the two halves of your orange, or your ½ grapefruit and pour the juice into the bottle. You can add some segments of either the orange or grapefruit if you wish some of the pulp in your ginger ale. Add ¼ cup of molasses. Lastly, add your ¼ tsp of yeast. Now you’re ready to add your water. First fill your bottle halfway and then cap it up tight. Shake the bottle vigorously for about a minute and blend all of the ingredients inside well. Now open up your bottle and fill it with filtered water until it reaches just at the curve of the shoulders of the bottle…this will correspond to about two inches below the mouth/opening of the bottle. This part is important! Squeeze the air out of the bottle with one hand…there’ll be a little bit of foam at the mouth of the bottle. Use your other hand to pat down this foam. When the liquid reaches the top of the mouth, keep it there…and cap the bottle tightly with your other hand. Shake the bottle vigorously for half a minute. Don’t worry…you won’t hear a lot of sloshing around, as you just removed the air. There’s a reason for this. Set the bottle in a fairly warm, open area, about 65 to 70 degrees F. Leave it there undisturbed. Now that your ginger ale has been bottled, you want to look for the bottle beginning to swell. This usually takes about 6-12 hours. Don’t open it! The yeast is fermenting, and you’ll ruin the process with the introduction of any air. When the shoulders begin to swell really firmly? It will then be time to refrigerate the bottle. Leave it in the fridge for 24 hours to complete the whole process…some of the swelling will diminish after this time is done. Careful when you open the bottle…your ginger ale is now carbonated! Yes, then all you need do (if you wish) is to strain the ginger ale into a glass and drink. Voila! You want to keep it capped tightly when not pouring it, and the carbonation will last about 24-48 hours. Measures up equally in taste with Reeds, and of course you can do other things, such as add some nutmeg or cinnamon to taste. Less on the sugars if you like it dry, keeping in mind it is the sugar that the yeast feeds on to ferment and produce the carbonation. 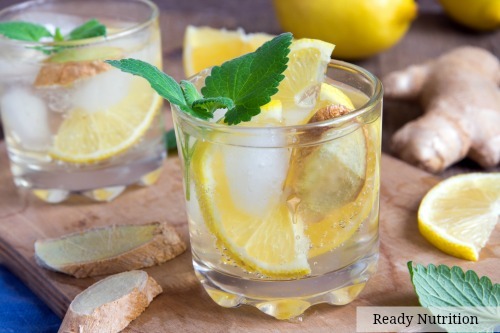 You’ll end up with a full-flavored Ginger Ale that is good for the stomach that you made yourself. So, with all of this, bottoms up, and I hope you enjoy the recipe! JJ out! For other homemade soda recipes, click here!